WCCLS is adding more titles to Library2Go, Oregon's downloadable ebook and audiobook service! 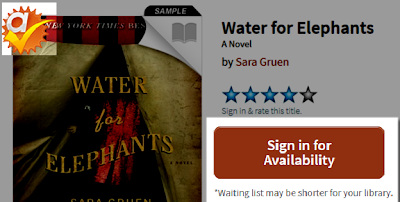 Most Oregon libraries participate in Library2Go and share the downloadable titles, but WCCLS is also purchasing ebook titles that are just for WCCLS cardholders. We are adding books that were not originally in Library2Go, and are also adding extra copies for books whose wait lists are really long. To be sure you see the titles that WCCLS has purchased just for our cardholders, be sure to log in to Library2Go before you start searching for books. You'll know a book has been added just for WCCLS cardholders if you see the seal at the top-left of the book jacket. You'll also notice that instead of Borrow or Place a Hold, the button will say Sign in for Availability. Questions about using Library2Go? Ask staff at your local library, or browse our online help pages.